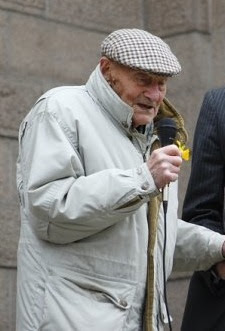 Emile Collins passed away today aged 98. Emile was a seasoned political campaigner, an enthusiastic follower -and often a critic- of Jersey politics. He was an avid contributor to the lunchtime BBC phone-in. He was both passionate and compassionate. Emile, will be missed but not forgotten. Agree whole-heartedly with Martin. To the BBC Emille was a pain in the arse. He would regularly be cut off, he was prevented from going on and presenters were rude to him when he was on. I shall, over the weekend, be publishing a Blog on the subject of "BBC State Contolled Media" Naturally I shall be providing documented evidence to back that claim up and once more it will make for scary reading. Emille’s Funeral will be held on Wednesday at 10.45 am at the Crematorium followed by a meeting at the Old Magistrates Court (back of Town Hall) from 1145am.Family, friends and former colleagues are welcome to attend.